wrong backlinks can break your rankings, get you penalized or even blacklisted by Google. How to distinguish one from another? Read on! How do search engines evaluate the quality of links? Google has become too smart to be deceived by the links from the irrelevant sites. For example, if your website sells tires, a link from the Mom’s Dish offers no real value and misleads both Internet users and search engines. Of course, there are a lot of sites that are relevant to diverse backlinks, for example, media platforms. Nevertheless we recommend taking into account the context each time you want to assess the backlink quality. If the referrer site is a 5 years old resource with a low traffic, it’s most likely to be low-trust. However such signals as high audience activity, growth and involvement (social signals) may increase both referrer site and your site’s ranking. A high quality backlink would come from a trustworthy site. To estimate the website trust, Larry Page and Sergey Brin in 1996 developed PageRank (PR). It evaluates the quality and quantity of the links determined by the relative score of that page’s importance and authority on a 0 to 10 scale. 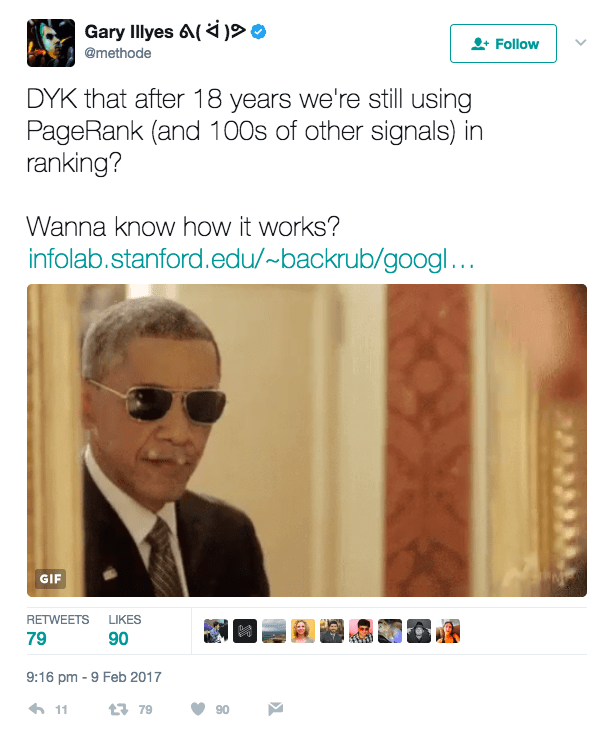 But in 2016 Google killed PageRank and removed it from the Google Toolbar but still use it internally in the ranking. How to assess the backlink quality yourself? Imagine that you can get a backlink at a very good price. First of all, check if the referrer site isn’t spammy, analyze its traffic, topics, domain zone, user involvement, a number of inbound and outbound links and their quality. If you are not pleased with these parameters, ignore the offer since such backlink can harm your rankings. – Domain age: preferably over a year old. Matt Cutts once said that the difference between a domain that’s six months old versus a one-year-old is really not that big at all. But he also admitted that valuable (legitimate) domains are often paid for several years in advance, while doorway (illegitimate) domains are rarely used for more than a year. Therefore, the date when a domain expires in the future can be used as a factor in predicting the legitimacy of a domain. Over 93% of 1st position domains are over a year old according to the SerpIQ study. – Backlinks: the more, the merrier if we are talking about links from the trusted and unique domains. The ratio of 1 outbound link to 2 inbound links indicates a “spammity” of a website. What does this mean? If there are few spammy websites in your backlink profile, then it’s really ok. If a half or more are spammy you are at risk to be penalized by the search engine. – Outbound links: the less, the better (including Nofollow and Dofollow). If a site is participating in the link schemes and refers to poor-quality resources with a low trust it can really affect your rankings. – Anchor: should be diverse and look as natural as possible. Make sure it’s relevant, corresponds to the topic, doesn’t contain grammatical errors and extremely short. In most cases, a natural anchor looks like a brand mention or general one: click here, this site etc. – IP: should be different for different backlinks. If the IP address is the same for at least 5 domains, the search engine can perceive them as the satellite sites (mini-sites created to promote the main one), and as a result penalize or ban the resource. – Social signals: a lot of likes, shares and comments on social networks. People share content if it’s great. What could be a more obvious signal for the search engine about the quality of the site? Of course, if the resource does not have social site buttons visible on its pages, this metric will not be relevant. So make sure the analyzed resource gives its audience something to like or share and by doing so increases a social visibility of your link. – Link indexing: inclusion of your link into the search engine database. If your link is not found, it’s likely that the search engine hasn’t indexed it so it doesn’t contribute to boosting your rankings. – MOZ DA: domain authority developed by MOZ that predicts how well a website will rank in SERPs. MOZ DA is scored on an 100-point logarithmic scale. The higher score corresponds to a greater ability to rank. Thus, it’s significantly easier to grow your score from 20 to 30 than from 70 to 80. – ALEXA RANK: a ranking system set by alexa.com to measure a website popularity. A site’s ranking is based on a combined measure of Unique Visitors and Pageviews. The lower the number determining this rating, the better. There are Global and Country ranks. Below is the TOP-3 sites in UK according to Alexa and the estimated daily time (mm:ss) on each site per visitor. Alexa’s Traffic Ranks are for the top level domains only (e.g., domain.com). They do not provide separate rankings for subpages within a domain (e.g., http://www.domain.com/subpage.html) or subdomains (e.g., subdomain.domain.com) unless they are able to automatically identify them as personal home pages or blogs. What to do with bad links? What to do? Use Disavow Links Google. This is a two-step process. First, you’ll need to download a list of links connected to your site. Next, you’ll create a file containing only the links you want to disavow, and upload this to Google. create a disavow file for uploading to Google. SE Ranking offers such option which makes it easy to discover bad links in a timely manner and disavow them in the bulk. To summarize things we were talking about above and to help you understand whether a backlink is worth your efforts/money/time use a comparative summary of good and bad backlink features. Which tools can be used to check backlinks? Different websites with services reviews like FitSmallBusiness could be very helpful in choosing a quality SEO tool. Here are 10 types of links that will help improve your link profile. Links from the trustworthy and reputable sites. Links from the press releases on the press release sites. Links from the article sites and directories (dmoz.org). Links in the video descriptions, links from the images and infographics. Links in the comments, forum posts and threads, Q&A sites (quora.com, Yahoo! Answers), blogs and the media. Links from the social media. Links to PDF, RSS and from the profile accounts (Facebook, LinkedIn, marketplaces). Links from the search engine sites (Google My Business and Google Maps). Links from the customer reviews. All companies, especially big ones, post the customer reviews on the main and other pages of their sites. If you can put a link to your own site next to your name, then buy a product and leave a good review. Links from government and educational domains. Links from .edu domains are very important for search engines, but it’s difficult to get them. As an option, you can run a contest among students with a $1000 prize. Many universities will definitely post such news with your link on their websites. Any advice how to integrate seranking.com with hosting billing platform WHMCS including “white label” feature with all WHMCS clients/accounts?Thank you.A WordPress plugin would be also nice feature which would boost a lot of new clients in the future. Concerning integration with hosting billing platform, as for now, there is no possibility for this. What we can offer is using our Affiliate Program, please, have a look here https://seranking.com/affiliate.html. By the way, we’re considering adding WP plugin so thanks for highlighting that!